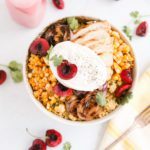 Today we are celebrating Lindsay’s, from Life Love and Sugar, 2 year blogiversary with a KitchenAid Mixer Giveaway and the most amazing Double Chocolate Cupcakes with Cherry Mascarpone Frosting! Because what would a celebration be without cake? 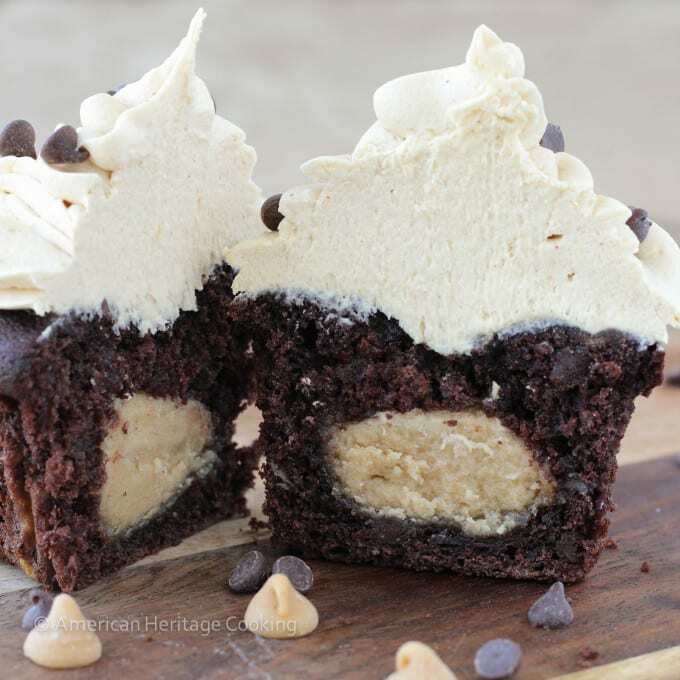 I planned to surprise Lindsay with some of these yummy Double Chocolate Cupcakes this week. I said “planned” because on my way back to the kitchen after the photo shoot, my cat darted under my feet and I tipped the rack just enough for all of my beautiful cupcakes to slide onto the floor. Each. And. Every. One. It’s so cliche I’m mortified even telling you. Because these cupcakes were insanely delicious! And because Lindsay would have loved them. But it’s all good because you will love them! 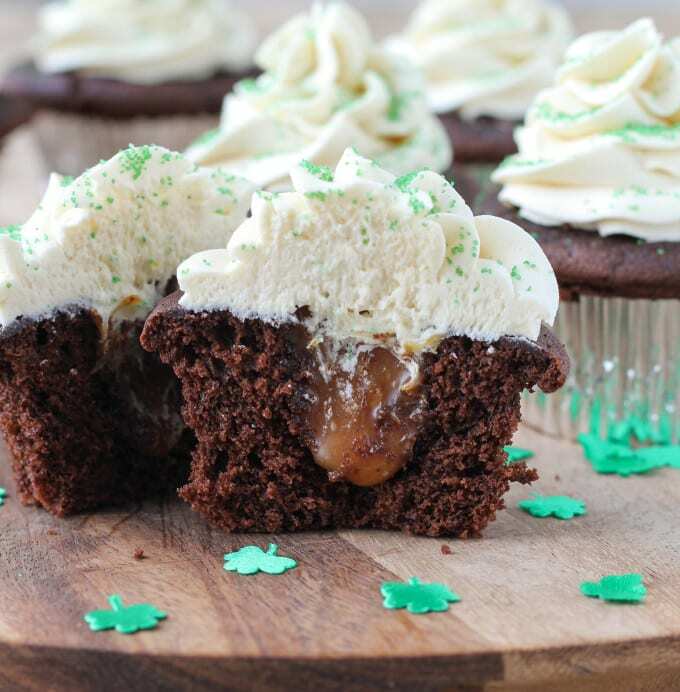 You will love the rich, deep chocolate flavor in these cupcakes. The rich flavor comes from a combination of cocoa powder and melted bittersweet chocolate. They are a chocolate lover’s dream! The chocolate lingers on your palate tantalizing you to take another bite. 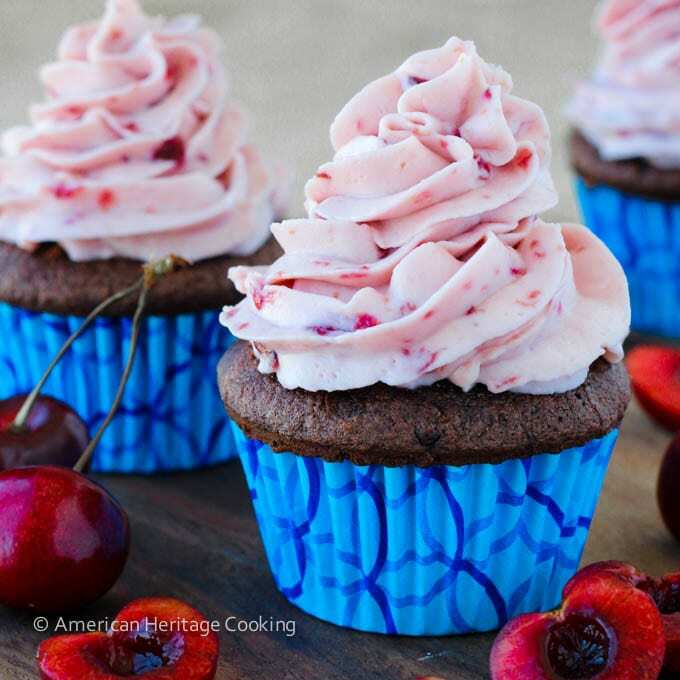 The bold chocolate flavor of the cake is perfectly complimented by the cherry almond compote filling and the silky cherry mascarpone frosting. 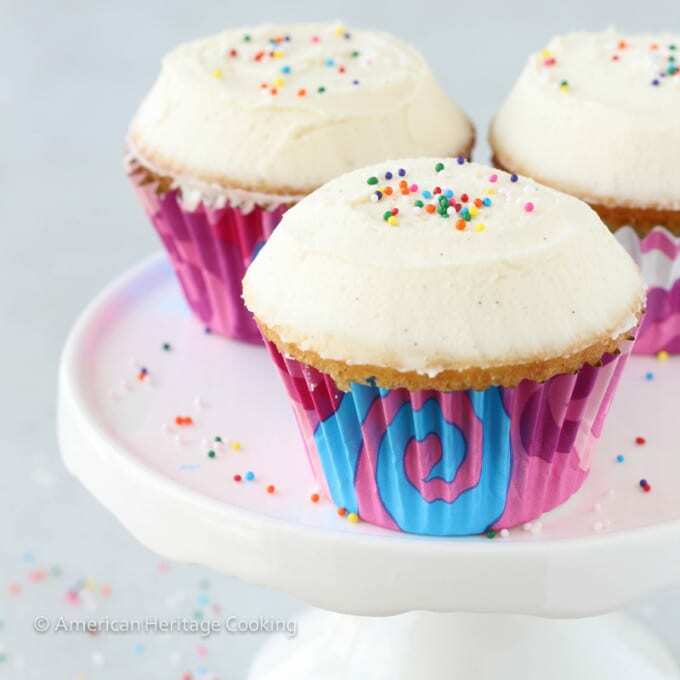 The cherry mascarpone frosting is light, creamy and will practically melt in your mouth. 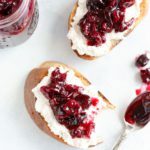 It is subtly sweet with just a hint of cream cheese, but packed full of fresh cherry flavor. I used some of the cherry almond compote filling in the frosting but you could also use cherry preserves. Just don’t use cherry puree. Yup, there is a story there, but we’ll leave that life lesson for another day! So back to the GIVEAWAY!! I am so excited for Lindsay! She is fast becoming one of my favorite bloggers and friends! I can attest to the fact that she is just as sweet in person as she is on her blog! 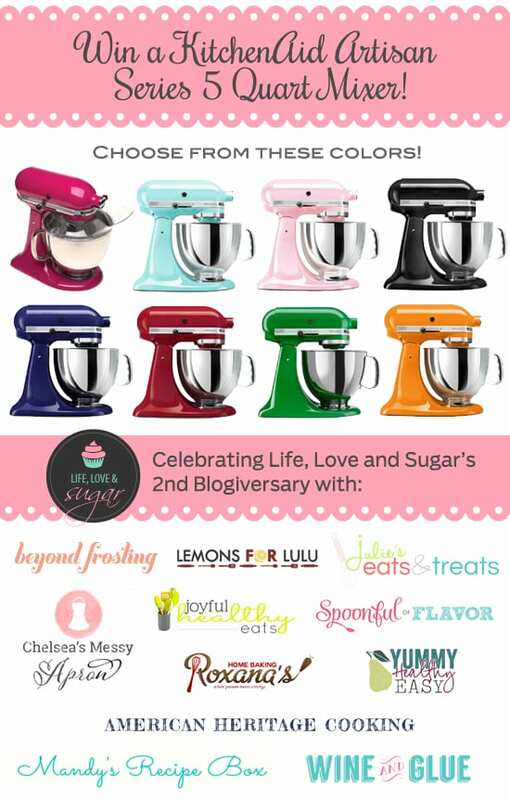 And she is celebrating her 2 Year Blogiversary by giving away a KitchenAid Artisan Mixer! Just enter the giveaway below and then go to Life, Love and Sugar and congratulate Lindsay on this milestone! 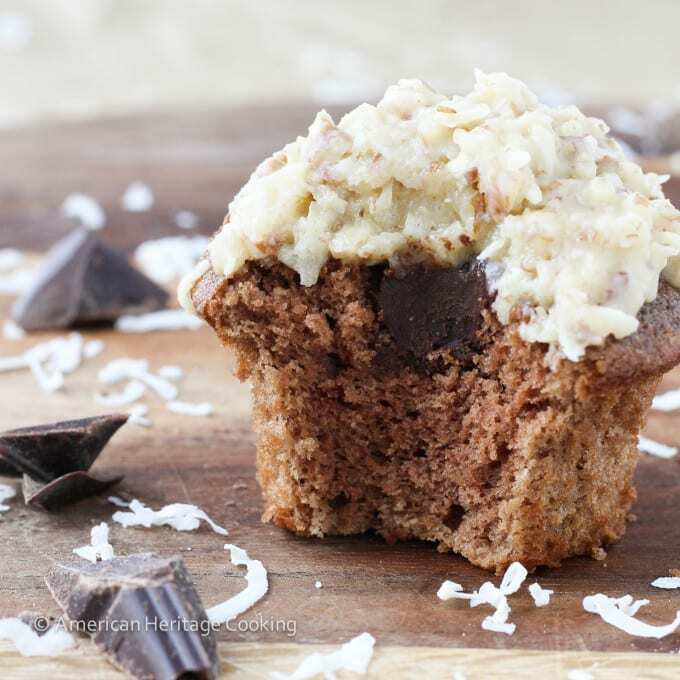 These rich sour cream chocolate cupcakes are dense and moist but still have a delicate crumb. 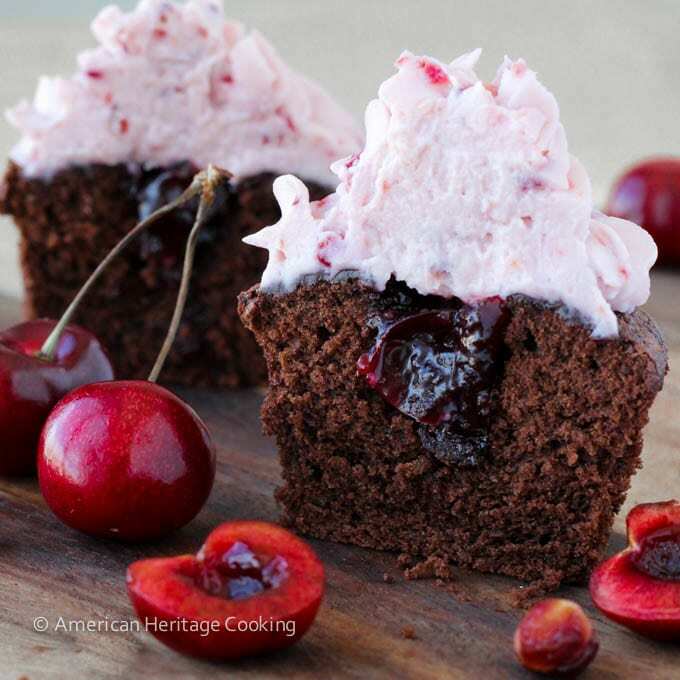 The bold chocolate flavor of the cake is perfectly complimented by the cherry almond compote filling and the silky cherry mascarpone frosting. Preheat the oven to 350°. Line two muffin tins with 18 cupcake liners. In a medium bowl whisk together the flour, cocoa powder, espresso powder, baking powder and salt; set aside. In the bowl of a stand mixer fitted with the paddle attachment beat the butter and sugar together on high until thick. Add the eggs one at a time, beating well after each addition. Add the vanilla with the last egg. Scrape down the sides of the bowl as needed. 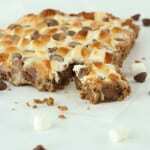 Add the melted chocolate and mix to incorporate. Scoop the batter into the prepared muffin tins. The batter should almost reach the top of the liner. Bake in preheated oven 15 to 20 minutes or until a toothpick inserted into the center comes out with a few clinging crumbs. 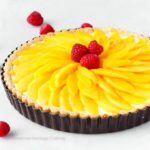 If you are going to fill your cupcakes with compote or use it in the frosting, then start your compote as soon as the cupcakes go in the oven. Or you could make it the night before. Taste your cherries. My cherries were somewhere in between tart and sweet. Adjust your sugar accordingly. 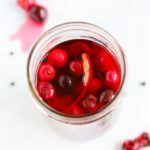 Mix sugar and cherries in a small saucepan and cook over medium heat, stirring occasionally, until the sauce thickens. 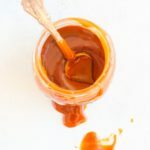 I cooked mine for almost an hour, but if you want to speed it up then mix 1 teaspoon of cornstarch with a little warm water and add to the compote, stirring and continuing to cook. In the last 15 minutes add the almond extract. Let cool completely before filling cupcakes or using in the frosting. You can store it in the refrigerator overnight if desired. 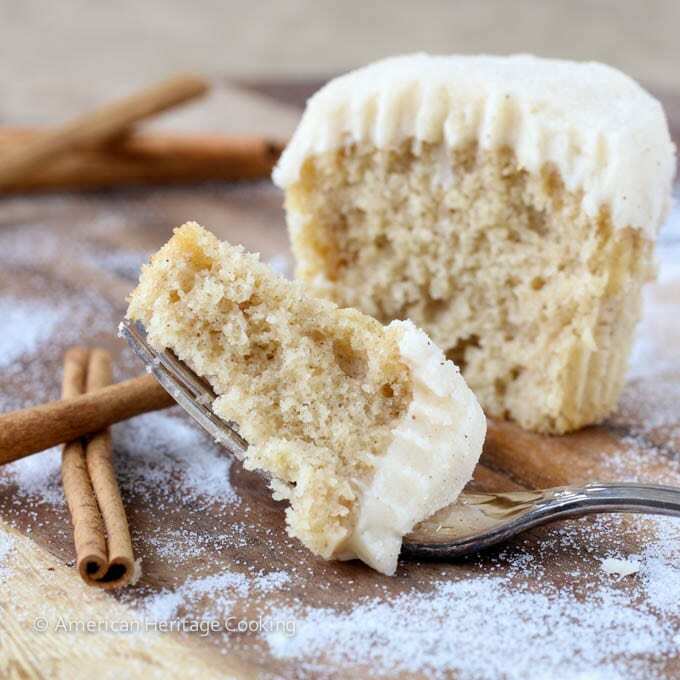 When it is time to fill the cupcakes make a small hole with a paring knife, eat the piece of cake, and fill hole with the desired amount of compote. Puree the cherry compote or cherry preserves; set aside. 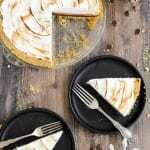 In a large bowl beat mascarpone, cream cheese and sugar until light and creamy with a hand mixer on high. Add the cherry compote or preserves. Continue to beat until the cherries are incorporated. Add heavy cream 1 teaspoon at a time until the frosting is at a piping or spreadable consistency. Store in the refrigerator but let come almost to room temperature before serving. 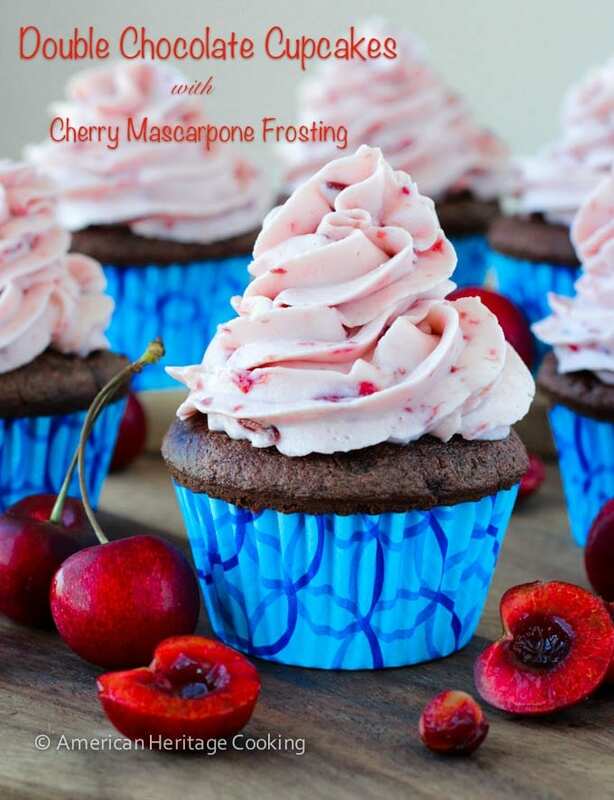 I love the cherry mascarpone frosting idea! These cupcakes look really scrumptious! Thanks, Kristi!! I was really tempted to eat one anyways but I resisted! Lol! Mini just wanted to play…so needy! Thank you, thank you!! So you are so sweet and I’m so glad to have you as a friend! I cannot believe that happened with your cat! I literally thought as soon as I saw that picture – “I hope she’s bringing some to lunch today”! What a bummer! Are they still on the floor? 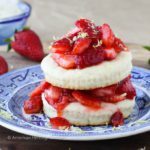 I might just lick that icing and compote right off – yum! 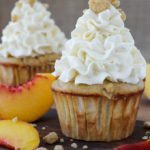 Lindsay @ Life, Love and Sugar recently posted…Lemon Blueberry Cupcakes and a Blogiversary KitchenAid Mixer Giveaway! I KNOW!!!! I was so upset! I had to clean it up before my cat ate the frosting off the floor! I feel super blessed to have met you through blogging!! Thanks, Gayle! If it had happened before I took photos, I would have had a melt-down. A full on melt down with tears! Awwww…sorry that happened! They look so chocolaty and delish. I love the colors too. What a thoughtful friend you are! Did you yell at your cat? Thanks! I never yell at my cat…she just wanted to play…and eat the cream that I used in the frosting! Wow! 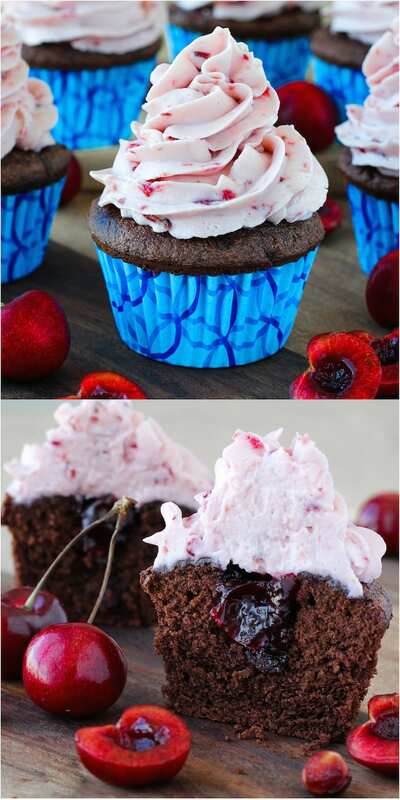 I am in awe of these amazing chocolate cherry cupcakes! Also wishing I lived in the US so I could enter this amazing competition! Thanks, Jessica! I wish you did too! 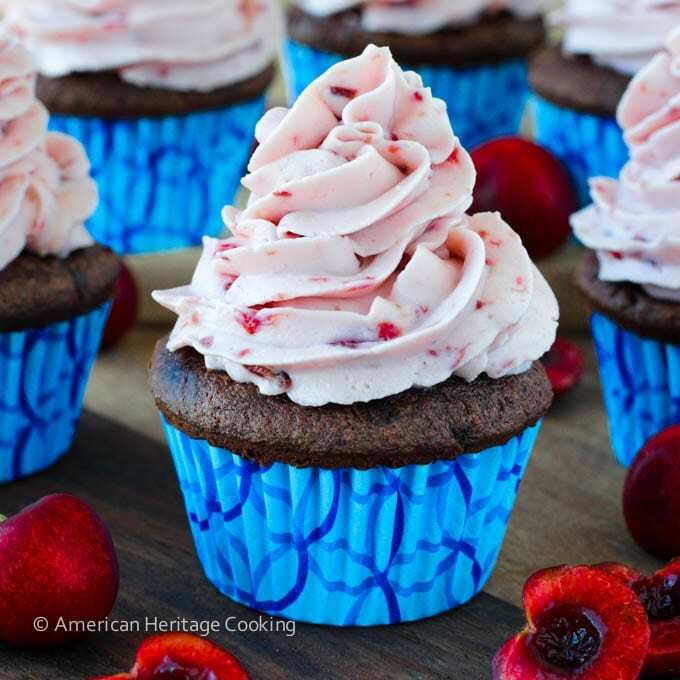 We love the chocolate-cherry combo around here and this looks like a winning cupcake flavor! That’s such a great idea to use mascarpone in the frosting. Yum! Thanks, Kristine! Can’t eat enough cherries these days! The mascarpone makes the frosting a little less dense than a traditional cream cheese frosting. These cupcakes look absolutely gorgeous Lindsey! 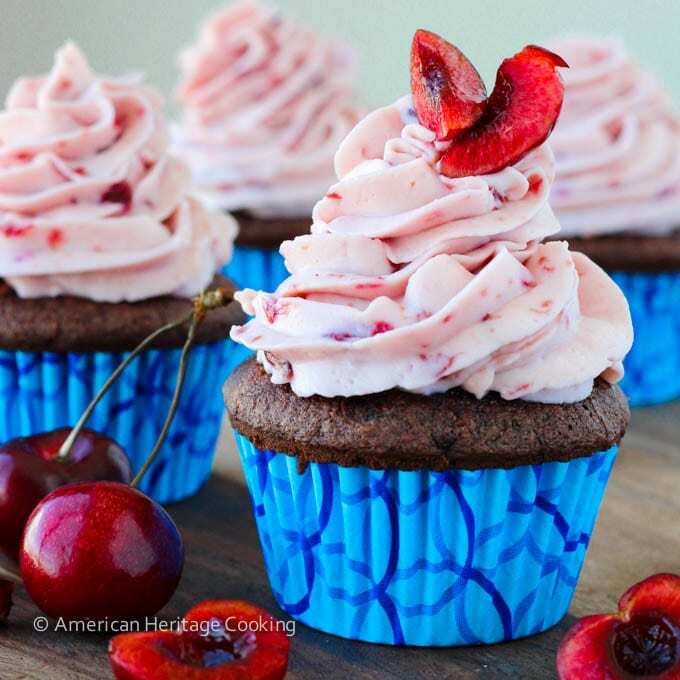 The cherry mascarpone frosting sounds divine! I’m so sorry to hear that 🙁 That was so sweet of you to make them for Lindsay and luckily you were able to take photos of these before that happened. Thanks, Kelly! The only thing worse than baked goods on the floor is baked goods on the floor before you can photograph them!! Lindsay gave me cake instead!! Winning! I spill food all the time! So clumsy! It sounds like we have that in common! Oh no, kitty! I would have cried. 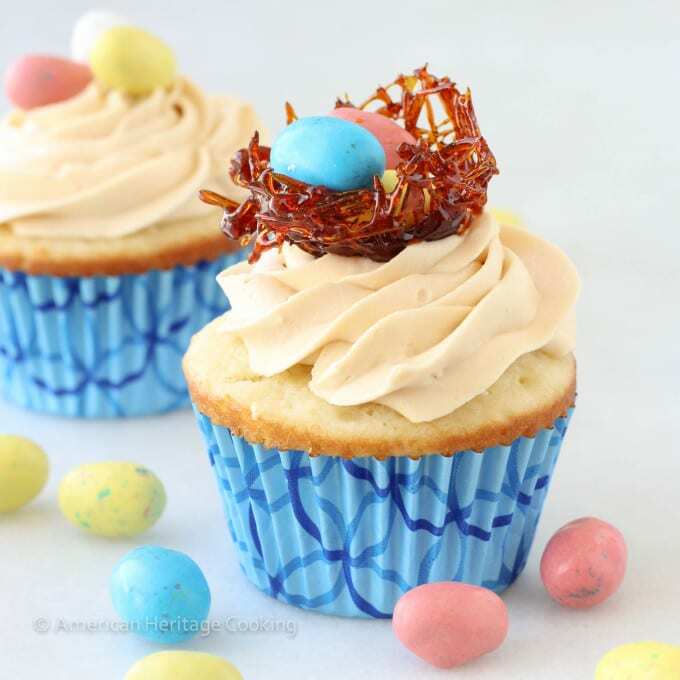 These look so delicious and the frosting is mouthwatering! I really love all the color in your photographs. So pretty! Thanks, Cindy!!! At least I ate one before they fell on the floor! 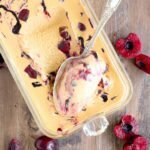 Cherries are my favorite summer fruit, and I love pairing them with chocolate! These cupcakes are so beautiful and I’m sure delicious too. Thanks! They are mine too!!! 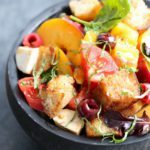 Well maybe tied with peaches! thank goodness it happened after! and there may have been a little frosting left in the bag…no waste around here!! !